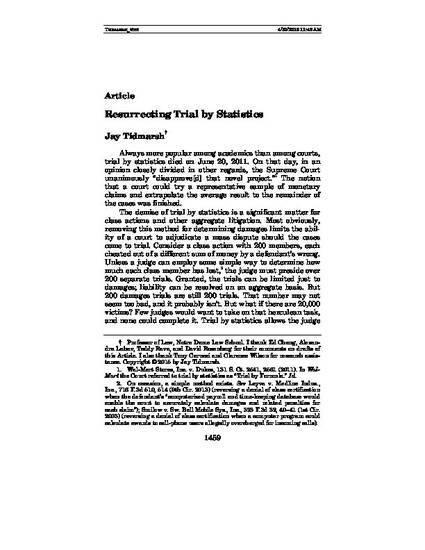 “Trial by statistics” was a means by which a court could resolve a large number of aggregated claims: a court could try a random sample of claim, and extrapolate the average result to the remainder. In Wal-Mart, Inc. v. Dukes, the Supreme Court seemingly ended the practice at the federal level, thus removing from judges a tool that made mass aggregation more feasible. After examining the benefits and drawbacks of trial by statistics, this Article suggests an alternative that harnesses many of the positive features of the technique while avoiding its major difficulties. The technique is the “presumptive judgment”: a court conducts trials in a random sample of cases and averages the results, as in trial by statistics. It then presumptively applies the average award to all other cases, but, unlike trial by statistics, any party can reject the presumptive award in favor of individual trial. The Article describes the circumstances in which parties have an incentive to contest the presumption, and explores a series of real-world issues raised by this approach, including problems of outlier verdicts, strategic behavior by parties, and the parties’ risk preferences. It proposes ways to minimize these issues, including a requirement that the party who reject a presumptive judgment must pay both sides’ costs and attorneys’ fees at trial. The Article concludes by showing that this approach is consonant with important procedural values such as efficiency, the accurate enforcement of individual rights, dignity, and autonomy.